This is a great, simple recipe to impress your guests and make children eat more veggies. These bites are super cute, healthy, and quick to make. You can serve as an appetizer or summer snack. In fact, this snack is so easy to make that you may want to double for a crowd. This great low-carb recipe lends itself to variety and experiment. Add vegetables of your choice to make your own version. These bocconcini bites are absolutely delicious, and you are sure to make them at least once in a while. Cut cucumber into slices and then into halves and cut Kalamata olives into thin slices. Rinse radish and also cut into slices. Use toothpicks or cocktail sticks to hold together. 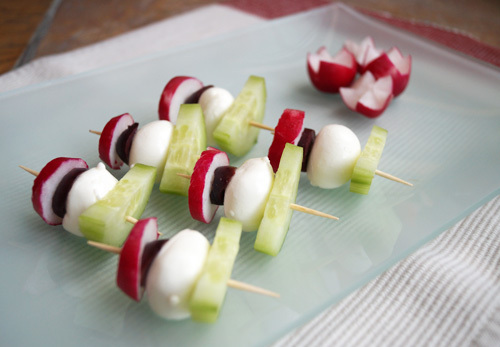 Place radish slices onto slices of olives and then add bocconcini cheese and cucumber. You can also make shapes if you have more time and have friends coming over. Cut cheese in zigzag with a sharp knife to create tulip shapes. Radish rosettes are a beautiful addition to your platter. Form the petals by making small cuts and put in a bowl of cold water for about 20 - 25 minutes so that the petals open up. Mix olive, vinegar, and a pinch of salt in a bowl to prepare a light dip for the cucumber brocconcini bites. Stir to combine well and sprinkle with freshly ground black pepper.